SAVABEEL (AUS) (Brown 2001-Stud 2005). 3 wins-1 at 2, MVRC WS Cox P., Gr.1. Champion NZ Sire 4 times. Sire of 805 rnrs, 557 wnrs, 85 SW, inc. Lucia Valentina (ATC Queen Elizabeth S., Gr.1), Sangster, Costume, Kawi, Soriano, Savvy Coup, Sword of Osman, Savaria, Embellish, Scarlett Lady, Shillelagh, Diademe, Pasadena Girl, Brambles, Hasahalo, Hall of Fame - Dances With Dragon (H.K. ), Sound Proposition, (I Am) Coldplay, Floria, Lady Kipling, etc. AVISTO, by Tavistock. 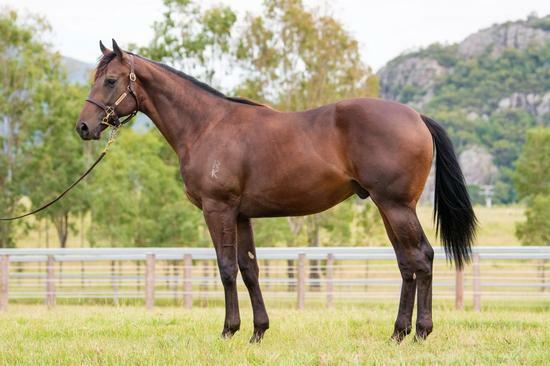 3 wins-1 at 2-at 1200m, 1400m, NZ$94,100, ARC Great Northern Foal S., L, Soliloquy S., L, Wanganui JC Fordell O'Leary S., L, 3d ARC Barfoot & Thompson 2YO S. Half-sister to CELTIC TIGER. Dam of one named foal. AVISTO (Tavistock). 3 wins. See above. CELTIC TIGER (O'Reilly). 2 wins at 1300m, 1600m, A$105,010, to 2018-19, SAJC Morphettville Guineas, L, 2d MRC Royal Hotel 2YO H.
Goko. 3 wins at 1000m, HK$2,119,800, to 2018-19, HKJC World-Class Leadership H., Cotton Tree H., Packing Winner H., 2d HKJC Bonham H.
Miracleofmiracles. Placed at 3 in 2018-19 in Aust. OUTDO (Exceed and Excel). Winner at 2, A$91,627, VRC Anzac Day S., L, 2d MVRC Mee's Buses 2YO H.
Miraculous Miss (Exceed and Excel). Winner. See above. Ballybrit. 4 wins at 1600m, A$137,520, MRC Browns Sawdust & Shavings H., MVRC Simpson Construction H., Quest Moonee Valley H., Adapt Australia P., 3d MRC Grand Hotel Frankston P.
Galway Warrior. Winner at 1400m, 2d VRC Leilani Series H., Lanec Services H., TRC Tasracingclub.com.au P.
Helix Park. 2 wins at 1200m, 1600m in 2017-18 in Aust. O'Fennessy. 2 wins at 1950m in Aust. PURE HARMONY (Stravinsky). 4 wins-2 at 2-to 1500m, A$208,670, MVRC Woodstock Classic Oaks, Gr.2, MRC Shoobra 2YO H., Beau Sovereign H., 2d VRC TCL Plasma H., 3d SAJC Irish Day H., 4th VRC Waltzing Lily H., L.
Galway Lass (Rhythm). 5 wins. See above. Irish Rebel (Danehill Dancer). 2 wins-1 at 2-at 1100m, 1400m, Manawatu RC New Zealand Bloodstock 2YO H., Singapore TC Class 4 H., 2d ARC Eclipse S., Gr.3, Matamata RC Slipper S., L, Singapore TC Novice S., Graduation S., Canadian Alumni S., Benchmark 74 H., Class 4 H., 3d Singapore TC Class 3 H., Class 4 H.-3 times, 4th Manawatu Sires' Produce S., Gr.1, WRC Wakefield Challenge S., Gr.2. Polyantha. 5 wins from 1400m to 2100m, ARC Auckland Co-Op Taxis H., Shamrock Recruitment H., Waikato RC Dunstan Feeds Qualifier, Ebony Grosve H., 3d Waikato RC Lallemand H.
Cape South. 3 wins from 1600m to 2050m, MRC Josephine H., 2d MRC Visit H., Bruce Patchell H., 3d VRC Moet & Chandon H. Producer. NO PUSHOVER (Pins). 4 wins from 1400m to 1600m, CJC Inglewood S., L, 3d ATC Tab.com.au H.
Fastfoot. 8 wins-1 at 2-from 1250m to 1600m, NZ$121,970, North Canterbury RC Coupland's Bakeries H., CJC Ford Fiesta on Cup Day H., Taranaki RC Seaton Park H., Wanganui JC AME Electrical H., 2d Otago RC Go Healthy H., Waikato RC Shaune Ritchie Racing Stables 2YO H., Central Otago RC Otago Summer Cup, 3d Southland RC Southland S., Gore RC O'Connor Richmond H., Central Otago RC Summer P., CJC Canterbury Club Luncheon H., Waikato RC Lodge City Rentals H.
DEIANIRA (Taufan). 7 wins from 1200m to 1600m, NZ$99,015, Te Aroha JC New Zealand Thoroughbred Breeders' S., Gr.2, Waikato RC Park Exhibition Hotel Melbourne H., L, ARC Saltram Wine Sprint H., Waikato RC Equine Pacific H., BOP RC John Dyke Ford H., Cambridge JC El Ganador Stud H., Rotorua RC Four Canoes Hotel H., 2d BOP RC Tauranga Classic, L, 3d ARC Railway H., Gr.1, 4th Waikato Draught Sprint, Gr.1. Producer. (Our) Coleraine (Sir Tristram). 2 wins at 2, QTC Look Aloft 2YO H., 3d QTC Air France H., L.